. 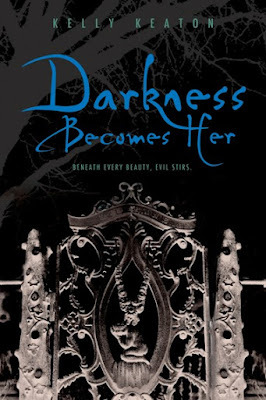 . . for Kelly Keaton's new young adult novel, DARKNESS BECOMES HER. ;-) Love the mood and look of it so much! The tree will be a clear spot gloss design over the black cover. My publisher is discussing printing this on metallic stock to bring out the silver in the gate, and possibly embossing the gate, and maybe the title as well. Whatever they do, I'm sure it will look stunning! And I'm over at Riding with the Top Down today. Yep, I'm adding this officially on my wishlist at my blog tomorrow. Hopefully, that will help get more of the word out! Cover looks great!